Today we announced how we’re planning to help you, our customers, modernize your IT infrastructure to be more productive and reap the benefits of cloud computing, data and mobility, no matter the size or location of your business. While we’ve addressed many of the technical barriers companies face in modernizing their IT infrastructures I’d now like to address an additional but critical barrier: access to capital to acquire these solutions. 1. Financing preserves cash and helps you “beat” your budget. Do I upgrade my IT infrastructure, or hire those new employees I need to really take my business to the next level? Companies face these tough decisions all the time -financing can take the pressure off by freeing your cash flow so you can invest it into other areas of your business. Not only do you get to keep your cash in the bank, but you move your IT costs into your run-the-business expenses with the comfort of a consistent monthly payment. You’ve essentially taken what could be a large upfront cost and transformed it into incremental low budgeted payments. 2. Financing increases your operational efficiency. What do you do with that rack of servers once you’re ready to upgrade? If you bought them outright, you’ll likely end up with a box of outdated equipment collecting dust in the corner of a storage room. However, if you leased those servers you can take advantage of flexible upgrade options or equipment return and disposal services Dell Financial Services offers. You can rotate out and replace equipment to scale your technology and handle future growth all while maintaining the same predictability in your budgeted monthly payments. 3. Financing lowers Total Cost of Ownership. 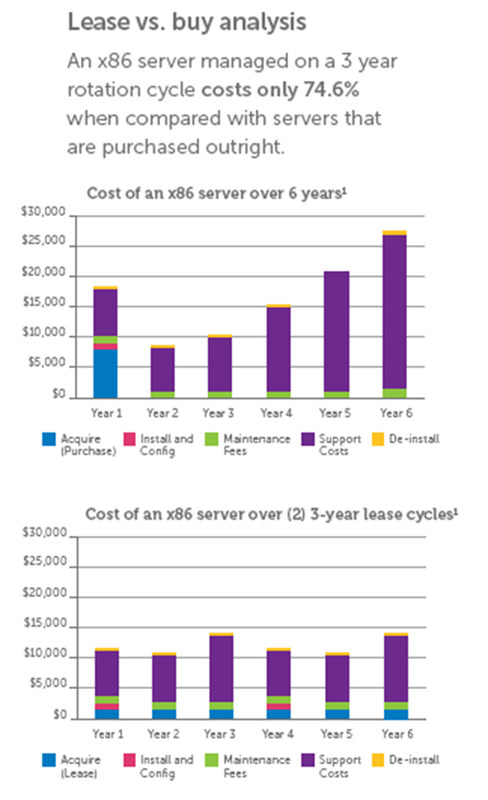 The numbers in the graphs to the right speak for themselves – studies show that when you buy IT hardware outright with the intention to own it for six years, your support costs will go through the roof after year three as you invest more resources to maintain and adapt the aging equipment to your changing technology needs. If you lease that same equipment, you can divide it into a couple of three-year rotations and maintain your support costs on a regular and consistent pace. Operational and Financial Factors to Consider,” (IDC #224920) September 2010. These are a few of the key benefits that have made financing the right choice for our Dell Financial Services customers. Don’t let access to capital be the barrier that holds you back as you look to modernize your IT infrastructure and prepare for future growth. Financing lowers that barrier to entry and enables you to take advantage of the newest innovations – like Dell’s flexible converged infrastructure – while increasing overall business productivity. What financial barriers do you face in acquiring the technology you need for your business? Have you considered financing and, if not, why not? I’d like to hear about your experiences, so please share your perspective in the comments below.